This article is about the actor. For other uses, see Colin Baker (disambiguation). Colin Baker (born 8 June 1943) is an English actor. He became known for playing Paul Merroney in the BBC drama series The Brothers from 1974 to 1976. He later played the sixth incarnation of the Doctor in the long-running science fiction television series Doctor Who from 1984 to 1986. Baker's tenure as the Doctor proved to be a controversial era for the series, which included a hiatus in production and his subsequent replacement on the orders of BBC executive Michael Grade. 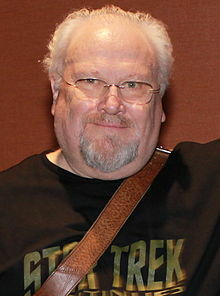 Colin Baker was born in Waterloo, London, England. He moved north to Rochdale with his family when he was three years old. He was educated at St Bede's College, Manchester, and originally studied to become a solicitor. At the age of 23, Baker enrolled at the London Academy of Music and Dramatic Art (LAMDA). Baker's numerous television roles in the early 1970s included a supporting role in a 1970 BBC adaptation of Jean-Paul Sartre's trilogy The Roads to Freedom, a leading role as Count Steinbock in their adaptation of Cousin Bette the following year, playing opposite Margaret Tyzack and Helen Mirren. In 1972 he played Anatole Kuragin, opposite Anthony Hopkins in the BBC adaptation of War and Peace. His regular television work continued and in Fall of Eagles, Baker appeared as Crown Prince Willy of the German Empire. By far his most prominent role to date came in 1974, playing the ruthless banker Paul Merroney in the hugely popular BBC Sunday evening family series The Brothers,. Baker joined the series half-way through its run, as Merroney became one of the leading characters over 3½ series from 1974–76. After The Brothers, although he worked regularly in theatre, his television work dried up for several years, although he guest-starred memorably as Bayban the Butcher in a 1980 episode of Blake's 7. This led to further TV guest roles and in 1983 he featured in a BBC production of A.J. Cronin's The Citadel. Baker made his first appearance in Doctor Who as Commander Maxil in the story Arc of Infinity (1983). Producer John Nathan-Turner described Baker's performance as being "quite arch" and a little sassy. Maxil was one of the few characters actually to shoot the Doctor, then played by Peter Davison. At the time of Baker's casting as Davison's successor, he was the only actor portraying the Doctor to have appeared in the television series as another character prior to taking on the leading role (in 2013 Peter Capaldi was announced as the Twelfth Doctor after having previously appeared in another role in the 2008 episode "The Fires of Pompeii"). When Baker was cast to replace Davison, many fans cited that shooting scene in Arc of Infinity, prompting Baker to say jokingly that he got the part of the Doctor by killing the incumbent. He is no relation to Tom Baker, who previously played the Fourth Doctor in Doctor Who. Baker's first appearance as the Doctor occurred at the final minutes of The Caves of Androzani, where he delivered his first few lines. The closing title sequence for episode four features Baker's face instead of Peter Davison and credits him as the Doctor before Davison's own credit. This was the first (and, to date, only) time that the new lead received top billing in the final story of an outgoing Doctor. Baker then made his first full story debut the following week in The Twin Dilemma. It was the first time since 1966, and only the second time in the series' history, that a new leading actor's debut story was shown before the conclusion of the previous lead's season. Baker's era was interrupted by an 18-month hiatus which was announced in February 1985, midway through transmission of his first full season. The Controller of BBC1 at the time, Michael Grade, criticised Doctor Who, saying that the programme had become overly violent in 1985. Grade later admitted that he "hated" the series, which he described as a "very clunky studio show". One new Doctor Who story, Slipback, was produced for radio during the hiatus, which starred Baker and his regular television companion Nicola Bryant. Doctor Who returned to television for its 23rd season in September 1986. The season featured a reduction in episodes, was made entirely on video for location scenes for the first time since 1975's The Sontaran Experiment and was produced as a 14-episode-long serial called The Trial of a Time Lord. This serial was a meta-textual reference to the fact that the series itself was "on trial" at this time. In 1986 Baker told an interviewer, "Tom Baker did it for seven years. ... There's a part of me which likes to have a tilt at records. I would like to think that maybe I'd still be doing it in eight years' time." However, later that year Michael Grade agreed to commission another series, on the condition that Baker was replaced. The BBC's Head of Series, Jonathan Powell, later said that the BBC was looking for "one last chance saloon, for an actor who would take off with the public." He was removed from the part after starring in only eleven stories and just short of three years in the series, including the hiatus, making his tenure as the Doctor the shortest at that point. After his sacking, Baker refused to return to record a regeneration sequence. Instead, his replacement, Sylvester McCoy, played the fatally injured Sixth Doctor in a blonde wig as he regenerates in the opening minutes of Time and the Rani, his face hidden by video effects as the regeneration process occurs. On 4 September 2011 at Riverside Studios, Hammersmith, London, Baker accepted the presidency of the Doctor Who Appreciation Society, which had previously been held by Jon Pertwee and Nicholas Courtney. Baker was elected following an online poll of the society's members where he won more votes than all the other candidates combined. From 5 June to 19 August 1989 Baker agreed to appear as the Doctor once more, in the stage play Doctor Who - The Ultimate Adventure, taking over from original lead Jon Pertwee who had fallen ill. In 1992, Colin Baker became the first Doctor to write a published Doctor Who story, The Deal, as part of Doctor Who Magazine's Brief Encounters series. He wrote a second Brief Encounter the following year. Both featured the Sixth Doctor and Mel. In 1994 Baker wrote a comic strip, The Age of Chaos featuring the Sixth Doctor and Frobisher, and in 2001 contributed a story entitled "The Wings of A Butterfly" to a charity short story anthology based on Doctor Who, "Missing Pieces". He also presented special Doctor Who videotape releases Cybermen – The Early Years in 1992 and The Colin Baker Years in 1994, with the latter a look back at his tenure on the series highlighted by clips and his memories. Baker reprised the role on television only once after his official run ended, in the 1993 Children in Need charity special Dimensions in Time alongside Jon Pertwee, Tom Baker, Peter Davison and Sylvester McCoy. In 1997 Baker provided audio dialogue for the BBC video game Doctor Who: Destiny of the Doctors. 1999 saw Baker voice his first Doctor Who audio adventure for Big Finish Productions, The Sirens of Time. As of June 2014 Baker has recorded 83 Sixth Doctor audio plays with more planned for future release. These audio plays are generally well received by fans and in a poll conducted by Doctor Who Magazine, Baker was voted the "greatest" of the Doctors in this format. In recent years, Baker has appeared on a number of DVD releases of his episodes, featuring in either "making-of" documentaries or commentaries. The documentary Trials and Tribulations, included in the 2008 DVD release of The Trial of a Time Lord examines his turbulent three years on the show. Peter Davison, Sylvester McCoy and Baker at the Doctor Who 50th Anniversary Celebration Weekend. In November 2013 Baker co-starred in the one-off 50th anniversary comedy homage The Five(ish) Doctors Reboot. Since leaving Doctor Who Baker has spent much of his time on the stage with appearances throughout the country in plays as diverse as Peter Nichols' Privates on Parade, Ira Levin's Deathtrap, Ray Cooney's Run for Your Wife and Ariel Dorfman's Death and the Maiden. For many years he has been a pantomime stalwart. In 2000 he appeared in Snow White and the Seven Dwarfs alongside actress Louise Jameson who had previously played the Fourth Doctor's companion Leela. In 2003 he starred in the Carl Rosa Opera Company's production of operetta H.M.S. Pinafore, directed by Timothy West. In 2008, he toured with ex-wife Liza Goddard in She Stoops To Conquer. More recent theatre appearances have seen Baker tackle the role of Inspector Morse in House of Ghosts and a UK tour of The Woman in White. In 1991 Baker played a Doctor-like character in the BBV video series The Stranger. This character appeared in six video adventures as well four audio stories. Another standalone BBV drama entitled The Airzone Solution appeared in 1993 and featured former Doctor Who actors Jon Pertwee, Peter Davison and Sylvester McCoy. Television work during the 1990s included guest appearances in the BBC's medical drama Casualty, The Knock, Dangerfield, the first episode of Jonathan Creek, Channel 4's adaptation of A Dance to the Music of Time and as himself as the resident celebrity in 'Dictionary Corner' on the daytime quiz show Countdown, also on Channel 4. In 2003 Baker appeared on Top Gear, participating on a one-lap run on the Top Gear track in a Honda Civic hatchback. Baker competed against a Klingon, a Cyberman, a Dalek, Darth Vader and Ming the Merciless. Baker came in 4th position, with the Cyberman coming 1st. A 2005 guest appearance in comedy sketch show Little Britain was never transmitted but can be seen in the deleted scenes special feature on the Little Britain series 3 DVD. Other television appearances have seen Baker appear in Kingdom, Hustle and Doctors. Away from his Doctor Who work for Big Finish Productions (see above), Baker appeared in the audio dramas Sapphire and Steel: The Mystery of the Missing Hour and the 3 part Earthsearch Mindwarp. The latter, based on a James Follett novel, was broadcast on the digital radio station BBC 7 in 2006. In 2010, Baker narrated and provided additional voices for Candy Jar Books' comedy sci-fi audiobook Kangazang, written by Terry Cooper. Baker's film work over the years includes The Harpist (1999), The Asylum (2000) and D'Artagnan et les trois mousquetaires (2005). In 2010 he filmed scenes for an independent feature film, Shadows of a Stranger. Since 1995 Baker has written a regular weekly column for local newspaper Bucks Free Press. A compilation of his articles from 1995 to 2009 were published in the book, Look Who's Talking. On 7 November 2012, it was confirmed that Baker would be participating in the 12th series of I'm a Celebrity...Get Me Out of Here! Baker finished in 8th place out of 12 celebrities, losing out to Eric Bristow. Baker's first wife was actress Liza Goddard who had appeared with him in the TV series The Brothers. Their marriage lasted 18 months and ended in divorce. With his second wife, actress Marion Wyatt, whom he married in 1982, Baker has four daughters. They also had a son who died of sudden infant death syndrome. Baker is a friend of American writer Stephen R. Donaldson, who dedicated his 1991 novel Forbidden Knowledge to him. Baker is a critic of fox hunting and was among more than 20 high-profile people who signed a letter to members of parliament in 2015 to oppose Conservative prime minister David Cameron's plan to amend the Hunting Act 2004. Gallimaufry: A Collection of Short Stories. Hirst Publishing. 30 September 2011. ISBN 1-907959-02-5. 1970 The Adventures of Don Quick Rebel Episode: "People Isn't Everything"
Happy Ever After Receptionist Episode: "The Ambassador"
Public Eye Town Hall Clerk Episode: "The Man Who Didn't Eat Sweets"
The Man Outside Glover Episode: "Murder Story"
Villains Reporter Episode: "His Dad Named Him After the General"
1973 The Edwardians Joseph Laycock Episode: "Daisy"
Great Mysteries George Barclay Episode: "A Terribly Strange Bed"
1974 Within These Walls David Jenkins Episode: "Prisoner by Marriage"
The Carnforth Practice Bob Anderson Episode: "Undue Influence"
1980 Blakes 7 Bayban Episode: "City at the Edge of the World"
1982 Juliet Bravo Frankie Miller Episode: "The Intruder"
1985 Jim'll Fix It Episode: "A Fix with Sontarans"
1993 The Young Indiana Jones Chronicles Harry George Chauvel Episode: "Palestine, October 1917"
1995 Harry's Mad Mr. Perkins Episode: "Meaty Chunks"
A Dance to the Music of Time Canon Fenneau Episode: "Post War"
The Bill William Guthrie Episode: "Going Down"
1998 Casualty David Vincent Episode: "An Eye for an Eye"
Time Gentlemen Please Professor Baker Episode: "Day of the Trivheads"
2001 Doctors Jack Howard Episode: "Matters of Principle"
2006 The Afternoon Play Judge Episode: "Your Mother Should Know"
Doctors Charles Dillon Episode: "Honourable Gentlemen"
Doctors Professor Claybourne Jarvis Episode: "The Romantics"
2011 Doctors Augustus Bloom Episode: "Every Heart That Beats"
2015 Star Trek Continues Minister Amphidamas Episode: "The White Iris"
2018 Celebrity 5 Go Camping Himself Episode: "S1 Ep2"
^ "Colin Baker biography". BFI Screenonline. Retrieved 5 May 2017. ^ "Ask Colin". Colin Baker Online. Archived from the original on 4 June 2010. Retrieved 28 July 2014. Having recently been digging out information about my ancestors, I would love to go back to to [sic] the end of the 18th Century and see just what it was like being a labourer on the land as my great, great great grandfather Thomas Baker was in Lound in Suffolk in the 1790s and it would enable me to go back a bit further too and find out about Thomas' parents and where they came from. I would like too to find out about my mother's Irish ancestry, which is quite difficult to uncover. ^ a b "Colin Baker: Time Gentleman". Cambridge News. 5 July 2012. Archived from the original on 23 September 2015. Retrieved 5 May 2017. ^ "Amid the suits, a man who stands out". The Guardian. London, UK. 3 April 2004. Retrieved 7 May 2017. ^ "Michael Grade delivers second opinion on Doctor Who: 'I was wrong'". The Guardian. London. 5 January 2009. Retrieved 7 May 2017. ^ David Woodward (Writer, producer, Director) (1986). They All Axed for Who (Television production). New Orleans: WYES. Event occurs at 0:05:30. ^ "Colin Baker". BBC Online. Retrieved 7 May 2017. ^ Trials and Tribulations – documentary on Colin Baker's era of Doctor Who (2008 2entertain DVD release). ^ "Colin Baker – Honorary President!". DWAS Online. 5 September 2011. Retrieved 5 May 2017. ^ "Inspector Morse Has Stage Debut with Colin Baker". What's On Stage. 5 May 2010. Archived from the original on 13 October 2012. Retrieved 28 July 2014. ^ a b Westthorp, Alex (16 April 2014). "Dr Who: Films of Peter Davison, Colin Baker, Sylvester McCoy". Den of Geek. Retrieved 5 May 2017. ^ "Doctor Who News: People Roundup". Gallifrey News base. 26 June 2010. Retrieved 10 October 2012. ^ "Celebrities: I'm A Celebrity... Get Me Out of Here!". ITV.com. Retrieved 28 July 2014. ^ Walne, Toby (1 April 2013). "Actress Liza Goddard: 'Money is made to be spent'". The Daily Telegraph. Marrying Dr Who and a glam rock star – a financially astute move?. ^ "Biography". Colin Baker Online. Retrieved 15 October 2014. ^ "Visits 'would help prevent deaths'". BBC News. 2 February 2000. ^ "Colin's Major role". BBC Three Counties Radio. 24 September 2014. Retrieved 4 December 2015. ^ Donaldson, Stephen R. (August 2004). "Gradual Interview". stephendonaldson.net. Retrieved 29 January 2014. Wikimedia Commons has media related to Colin Baker.